The bestselling novel by Indian author portrays the introspective journey of Lucky Boyce, a woman faced with surprising life challenges after being cast aside by her traditional Indian husband. By tuning into the lessons of coincidence and harnessing the power of yoga, Lucky cultivates a sense of clarity that people today are striving to achieve. "I want every woman in the world to read Bapsy's book!! That is Lucky Everyday"
Lucky Everyday (2009. The bestselling novel by Indian author portrays the introspective journey of Lucky Boyce, a woman faced with surprising life challenges after being cast aside by her traditional Indian husband. By tuning into the lessons of coincidence and harnessing the power of yoga, Lucky cultivates a sense of clarity that people today are striving to achieve. Lately, Lucky’s life has seen nothing but trouble. Her marriage to the wealthy and charming Vikram ended badly, and along with it, her career as a successful entrepreneur. It’s time for her to start over and Lucky is more than ready to leave her old life behind. So Lucky goes to New York where her quest to get her life back on track begins with promise. A voluntary assignment as yoga instructor brings her some new and unusual friends, and a chance encounter with her old friend, Amay, makes her realize that a second chance at love might just be possible. And when she finds a job with an old associate, she can’t help but think that leaving Bombay was the best decision she ever made. Bapsy Jain was born in Calcutta, India. She completed her schooling from Presentation Convent, Kodaikanal and graduated from the Sydenham College of Commerce and Economics, Mumbai. She then left for UK to further pursue her education in finance and became a member of The Institute of Chartered Accountants England and Wales. Bapsy married Nitish Jain on the 23rd November 1985 and they have two sons. Together Bapsy and Nitish Jain have set up business schools under the name of S.P. Jain Center of Management in Dubai, Singapore and Sidney. 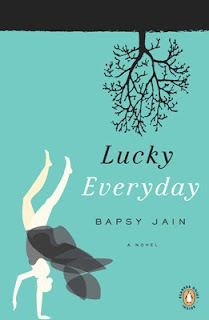 Bapsy is also on the board of several international organizations.A forced bed rest made Bapsy pick up the pen and lead to her first book “Lucky Everyday”.